When a machine component is subjected to a load (Static or dynamic load), it will experience the bending along its length due to the stress induced in it. This stress is known as Bending stress. Besides, there are other types of stress are also induced. They are Tensile stress, Compressive stress, Shearing stress, Bearing stress, Torsional stress. In this case, we supposed to consider the beam subjected to pure bending only to find out the bending stress in curved beams. Bending stress is the normal stress induced in the beams due to the applied static load or dynamic load. 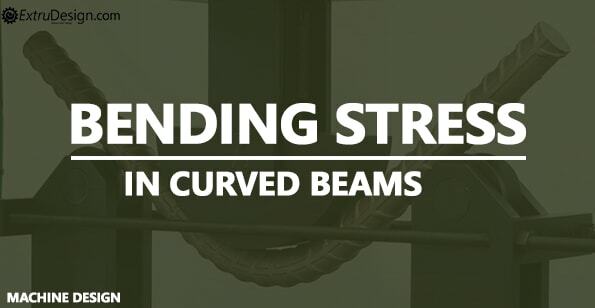 The study of bending stress in beams will be different for the straight beams and curved beams. In this article, we will discuss the Bending stress in the curved beams. In the previous article, we have discussed the bending stress in straight beams (Initially straight). Now we are going to discuss the bending stress in curved beams (Initially curved). In Straight beam, it is considered that the centroidal axis and the neutral axis coincide. But in curved beams, it is considered that the neutral axis and the centroidal axis do not coincide rather the neutral axis will be shifted towards the centre of curvature. Due to the shifting of the neutral axis towards the centre of curvature, the stress distribution in the curved beam will be non-linear. Wondered where we use the curved beams? Have you seen the Crane hook? Yes, crane hooks and chain links, Punches, presses and planers. these are the best examples for the initially curved beams. Consider an initially curved beam which is subjected to the bending moment M. The assumptions are made as same as the straight beams(Mentioned at the end of the article). The following are the notable things that we will be observed while finding the bending stress in the curved beams. In curved beams, the bending stress induced in the inside fibres tends to tensile stress whereas the outside fibre tends to compress. M =Bending moment acting at the given section about the centroidal axis. from the above equation, we can find out the bending stress for the curved beam at any fibre. Each layer in the beam has to expand or contract freely and independently. The Young’s modulus is to be same for both the tension and the compression. b) In addition to the bending moment if there is axial load then the axial load can be alphabetically added to the bending stress to obtain the resultant stress on the given curved beam. Regarding your article on “Bending Stress in Curved Beams”, it is very simple and straightforward, but it appears you omitted a necessary step in being able to use the stress formulas — How does one determine the radius of curvature of the neutral axis, Rn? Without this value the distance from the centroidal axis to the neutral axis, e, cannot be found. This is true of course when the load on the curved beam tends to open (or straighten) the beam. However when the load tends to close (or further bend) the beam, the stress in the inner fibers are in compression, while the stress in the outer fibers are in tension. I would assume all the formulas otherwise remain unchanged and applicable. Sure! I will update that and let you know mate. Many thanks for your valuable observation.